A Median Fillies' Auction Stakes over 6f 8y on good to firm going. Fifteen juveniles part part. The betting suggests this is a four-horse race. I will detail a few thoughts regarding the major players. 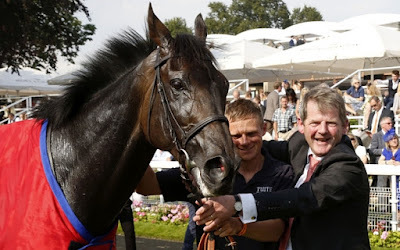 Joseph Tuite has a decent filly with Madam Dancealot who went very close to winning on debut at Chester, only beaten by Mehmas, who finished second in the Coventry Stakes Group 2 at Royal Ascot and favourite for the July Stakes Group 2 at Newmarket today. Madam Dancealot finished ninth of seventeen last time out when beaten in the Queen Mary Stakes Group 2. That was a creditable performance behind the runaway winner, Lady Aurelia, who looked more like a boy than a girl and won like a steam train. This is a marked drop in class for this daughter of Sir Prancealot who originally cost just £5,00 when purchased at the breeze-up sales in April and then sold at Goffs breeze-up sale in June for £100,000 (not a bad profit in a couple of months!). She is clearly a talented juvenile and must go well here. At odds of about 3/1 she looks a great bet for an each-way double. If drifting to an each-way price for a single bet I'd jump at the chance. I had an each-way bet on Stop The Wages last start. It was a frustrating race to watch as this daughter of Acclamation was much too keen in the early stages and then tired dramatically in the last half furlong to lose third place on the line which looked very unlikely to happen for the most part. Brian Meehan seems a little short on talented juveniles this year and a few have run indifferently. Connections rate this filly and I know they were disappointed by that last start. This faster ground will be to her advantage although this is tougher race. It's interesting that Meehan has a 7lb apprentice in the saddle, which gives the impression they are looking for every conceivable angle to get this fillies head in front. Stop The Wages is priced about 10/1 on the exchanges, which is tempting to some point although I do have concerns this youngster although potentially a winner is not straightforward. I wouldn't knock someone having an each-way bet as I think she will go well but she needs to settle in the first two furlongs because she may struggle if expending too much energy with a few fair types who will be chasing her home. Clive Cox is a trainer who knows his juveniles and Ariena was fancied in the betting on debut and Salisbury and ran well behind Hellofahaste in third place. This home-bred daughter of Arcano was sent through the sales ring and bought by vendor for 7,000G. It is encouraging to see she holds a Lowther Stakes Group 2 entry. Definitely holds each-way claims and another if drifting to bigger odds would make a sterling single bet for win and place. Another two-year-old fancied to go well is Ralph Beckett's Aureana. This home-bred daughter of Kyllachy was bought in for 9,500G so legible for this race type. The stable have been in good form and have a number of talented juveniles to measure the ability of this bay filly. To be fair, she will need to be pretty smart to beat the above mentioned horses who have valuable race experience and fit and ready to win. I would take a watching brief. Conclusion: For this race type its a tough race. Madam Dancealot is a talented juvenile and ran well on debut and wasn't disgraced at Royal Ascot. This will feel like a much easier task and connections will be disappointed if she doesn't win. Whether this extra furlong is a positive or a negative is a matter for debate. If available at an each-way price must be a strong bet. Ariena ran well at Salisbury when third, giving the impression there is better to come. From a statistical point of view this filly has decent each-way claims and if drifting in the betting looks the type to go well. The Lowther Stakes Group 2 entry is notable. Stop The Wages has claims at a price and if available at 10/1 may be worth bet and could well hit the frame. Even with the 7lb claimer I still have slight concerns she will struggle to beat the two mentioned. I do, however, feel connections rate this filly and she may go better today on this faster going.